Up and down, line after line, row after row. It is no wonder that teenage entrepreneurs across the suburban landscape mow their way to college. These young bucks may have the energy to push a mower up, down and around an acre's worth of lawn but most of us grow tired this old-fashioned chore. Yet, these kids grow up. They go to college. Still the lawn needs to be mowed. That is why riding lawn mowers are in such high demand. They are faster, more comfortable and easier to use than their pushy predecessors. First off, there are two types of riding lawn mowers; conventional and zero-turn-radius (ZTR) mowers. Both are rear-engine machines (meaning that you will be sitting on the engine) but vary in movements. Conventional riders are fast enough but use considerable space when turning around. ZTR mowers will turn around on the spot and tend to be quicker than their conventional counterparts. Terrain. Note the layout of your yard. Is it hilly? Is it riddled with trees, shrubs and other obstacles? These are some of the things that drove you crazy with the old push mower, so don't let it happen as you upgrade to a rider. If your lawn is wide open then a conventional mower should do the trick. However, if there are plenty of trees to maneuver around, look into a ZTR model that will cost more but may cut mowing time in half. The key here is that you don't buy what you don't need. Time. How much time will you spend mowing? If you have a fairly small lawn then perhaps you can sacrifice a little comfort for a lower cost. For larger yards, where you'll spend some serious time on the mower, comfort becomes a critical issue. Storage and Size. Where will you put the riding mower? Where does it have to go? These questions are often overlooked. Most homeowners have small sheds that may be a tight fit for the smallest of riding lawn mowers. Even more have fence gates and narrow rows the mower will have to get through. These are important considerations when choosing your mower. 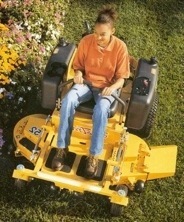 Some mowers have narrower and or shorter bodies than others. Accessories. How do you want to use your mower? You find riding mower accessories (and replacement parts!) easily at the manufacturer's website, like the John Deere parts catalog. Consider attachments such as bags or mulching blades. Grass clippings are great for compost heaps or, if you don't want to take the time, mulching attachments will slice and dice the grass down to shavings and distribute them across the lawn as you mow. Riding lawn mowers also have attachments for towing small trailers behind them for cleaning up yard debris and other tractor-like functions. Budget is the most important consideration. All the aforementioned variables will depend on your budget. Knowing how much to spend ahead of time will determine what you get. Decide the most important features your new riding lawn mower should have and base the purchase on what you can get for the money you have. Don't forget to consider the cost of riding lawn mower maintenance, and availability of parts and service techs. Once you've made the proper considerations and shopped around, get yourself that riding mower! Most homeowners are busy people; juggling work, leisure, and landscaping. Purchasing the right mower will add leisure time to Saturday afternoons. Remember that the best lawn mower riding is done when it transforms from a chore to a leisure activity itself!